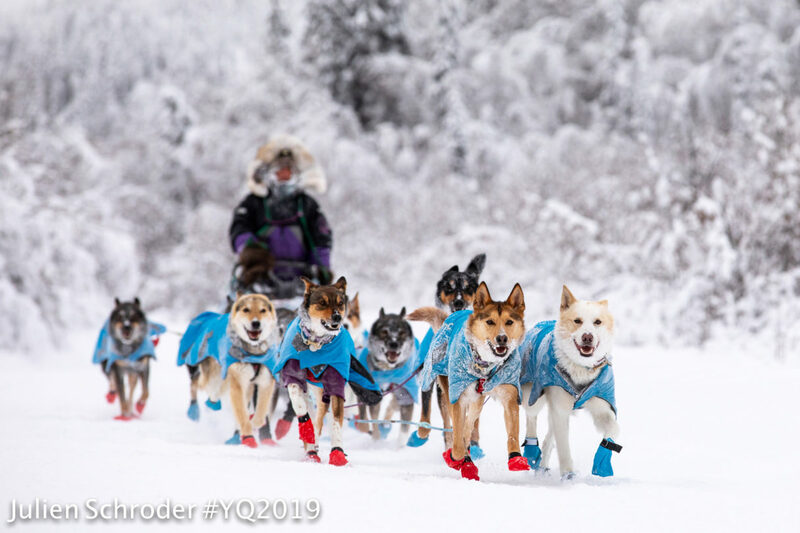 It’s back on the trail for the top 11 mushers in the 2019 Yukon Quest, after completing a mandatory, 36-hour layover in Dawson City. And they don’t seem to be wasting any time: as of 12noon Thursday, there hasn’t been a team yet who’s left more than 7 minutes after they’re eligible, with the top five departing the checkpoint the precise minute their mandatory time was up. Brent Sass, Michelle Phillips, Hans Gatt, Allen Moore, and Paige Drobny make up the current top five, officially. Martin Reitan, the rookie from Kaktovik who made an impressive jump from 16th position to 11th position when he checked into Dawson, was the most recent musher to leave Dawson, checking out at 11:44am PST with all 13 of his dogs. For those who are on their way out of Canada and on the 150 miles to Eagle, Alaska, a small border crossing formality awaits them. According to Webber, the race does pre-clear mushers, but they will, in fact, have their passports in hand as they cross over into Alaska. Webber remarked how it is unusual to see no scratches at this point in the race — a pleasant surprise. As the day goes on, several more mushers are scheduled to leave Dawson City and join the front-runners on the trail. For the next Yukon Quest update, tune in at 5pm on KNOM: 780 AM, 96.1 FM.